NASA's STEREO mission will be launched in 2006 with the goal of imaging the sun and the solar winds in 3-D. We should be able to see the Sun in 3-D around the end of Summer 2006 if everything works well. 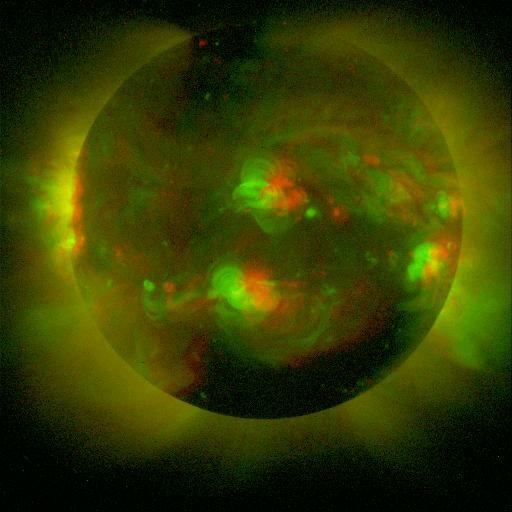 NASA's STEREO mission will be launched in 2006 with the goal of imaging the sun and the solar winds in 3-D. According to NASA/Goddard Space Flight Center and to the Johns Hopkins University Applied Physics Laboratory (APL), two identical spacecrafts will be placed in different orbits to provide us with 'stereo' views of the Sun. After the launch in Spring 2006, the two observatories will be separated after a couple of months, one orbiting ahead of the Earth, and the other staying behind. So we should be able to see the Sun in 3-D in less than a year. Of course, 3-D images of the sun have already been built. For example, below is a 3-D view of the Sun made from two images taken by the Soft X-ray Telescope on the Yohkoh satellite (Credit: NASA/ISAS/David Batchelor). And here is a link to a larger version of this image. Before we can see these kinds of images shot by the two STEREO (Solar TErrestrial RElations Observatory) observatories, they need to be deployed in space. But what will exactly be their mission? Here is NASA's answer. During its two-year mission, the two nearly identical spacecraft will explore the origin, evolution, and interplanetary consequences of coronal mass ejections (CMEs), the most violent explosions in our solar system. When directed at Earth, these billion-ton eruptions can disrupt satellites, radio communications, and power systems. In addition, energetic particles associated with CMEs are a serious hazard to spacecraft and astronauts. APL gives more details about the mission. To obtain unique "stereo" views of the sun, the twin STEREO observatories must be placed into different orbits where they’re offset from each other and the Earth. One observatory will be placed ahead of Earth in its orbit around the sun and the other behind. Just as the slight offset between your eyes provides you with depth perception, this placement will allow the STEREO observatories to obtain 3-D images and particle measurements of the sun. Below is an illustration showing the separation of the two STEREO spacecrafts (Credit: NASA). And here is a link to an animation of this separation (Quicktime format). Here is how APL describes what will happen at the beginning of this mission. After launch, the observatories will fly in an orbit from a point close to Earth to one that extends just beyond the moon. Approximately two months later, mission operations personnel at APL will synchronize spacecraft orbits, directing one observatory to its position trailing Earth in its orbit. Approximately one month later, the second observatory will be redirected to its position ahead of Earth. So we'll have to wait until the end of Summer 2006 before discovering exciting new views of the Sun in 3-D. But in the mean time, you can find tons of information about this mission on the NASA's STEREO project site, including images and videos in this multimedia gallery.